Northern Tablelands MP Adam Marshall in front of the new highway patrol car for the New England. 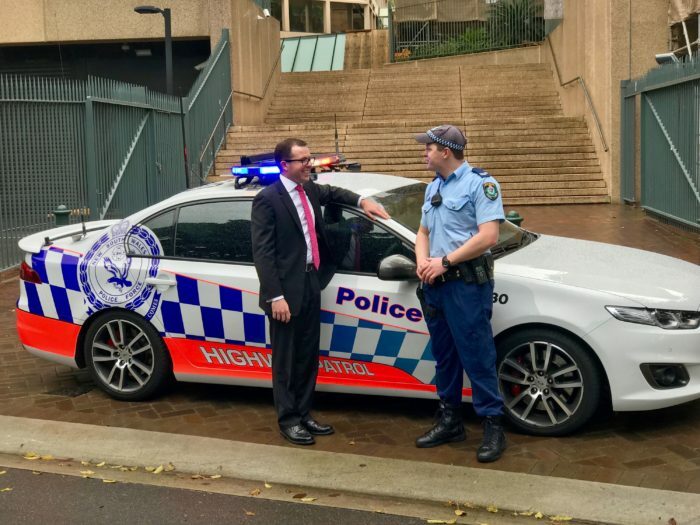 MEMBER for Northern Tablelands Adam Marshall has welcomed $4.8 million in NSW Government funding to roll out 28 new highway patrol vehicles across the state, including an additional vehicle in the region, to crack down on dangerous drivers and help reduce the road toll. Mr Marshall said one of the new high visibility vehicles had already been deployed to Armidale to cover key crash hotspots on the New England and Newell Highways. The New England Police Command now has 20 highway patrol cars. “We’ve lost more than 280 people on our roads so far this year because of speed related crashes,” Mr Marshall said. Mr Marshall said the high visibility cars would be out on highways right across NSW where speeding is most likely to have devastating consequences. “Speeding kills and now those who flout the law have another 28 reasons to think twice about their driving behaviour or risk being caught,” he said.